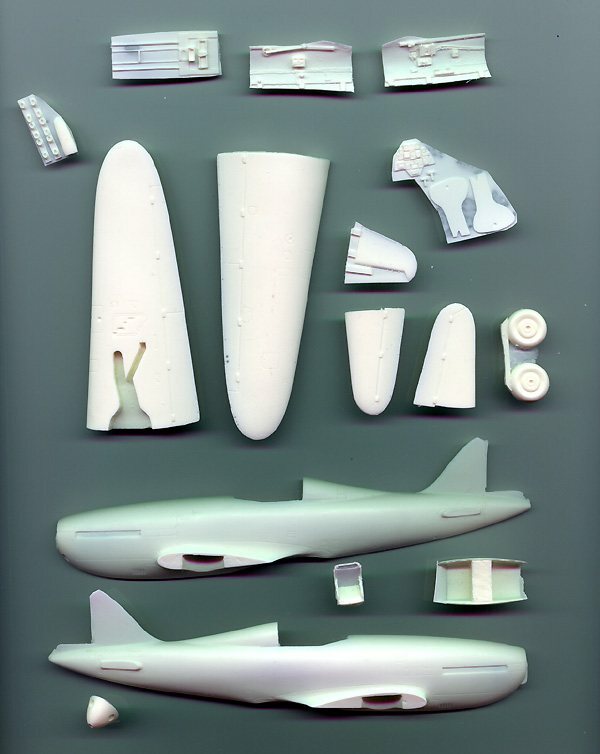 Kit's resin with white metal and vac parts. Whatever else the French Air Force may have been wanting, it certainly did not lack for aircraft designs on the eve of WW2. Many of these were produced in small numbers before the Armistice, and had little effect on the outcome of the war. One such design was the VG 33 produced by Arsenal. The VG 30 series were single-seat light fighters made primarily of wood. The production model was the VG 33, which combined the wings of the VG 30 and the fuselage and engine of the VG 31. It was fast and nimble, outperforming the standard French fighter of the day, the MS 406. Armed with one 20mm cannon and four 7.5mm machine guns, it packed a punch disproportionate to its small size. Nearly 150 were built between 1939 and 1940. Only 19 were airworthy during the few weeks of combat before the Fall of France; the rest lacked engines because of France's inefficient and overtaxed aviation industry's inability to provide them. Pend Orielle has been producing lesser-known aircraft for quite a while. The VG 33 appears to be one of the better offerings in their catalog, at least in terms of the quality of molding. It's certainly a far cry from the first kit of theirs I bought, the Su-2. Inside the small box are 24 resin parts, two clear vac canopies, 12 or so white metal parts. Decals for one machine and six pages of photo-copied instructions round out the package. The resin bits make up the majority of the airframe and cockpit. Detailing is pretty good, both on the outside and in the "front office". There was almost no flash, pits, bubbles or other surface flaws that I could find on my kit. The resin is very soft and sands readily. Panel lines are finely engraved, but not so fine that they'll disappear at the first pass with a sanding stick. The cockpit consists of floor, sidewalls, seat, stick and instrument panel. The detail on these pieces is sharp and should stand out with a little drybrushing. Metal parts are provided for the prop (3 pieces) and landing gear (no worries about the gear deforming over time, thankfully!) There is only a bit of mold seam to clean up on the pieces I have. The vac canopies are on one sheet of relatively clear acetate. They'll benefit from a bath in Future. Framing is a little soft, but not so much as to make painting and masking a nightmare. 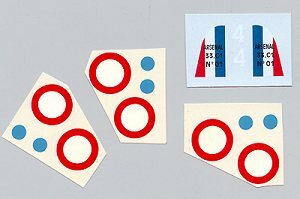 Decals consist of six roundels with separate blue "dot" inserts - no registration problems here. The rudder stripes carry the legend for VG 33 C1 No. 1. According to the marking guide, this aircraft was painted overall aluminum, while subsequent aircraft received a three color camo over light blue undersides. If you want to do a camouflaged airplane, you'll need to redo the tail stripe decal. 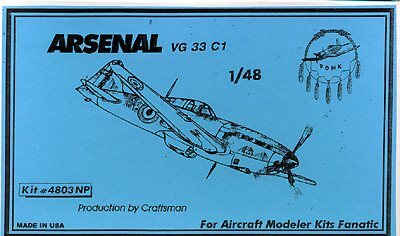 The instructions contain a brief history of the aircraft in English and French, various three-view and cut-away diagrams, and a parts list. References are listed, apparently French documents, which are available for $3.00 each - presumably from POMK. The assembly guide consists of a page and a half of exploded drawings in four steps. They're clear enough, if you're used to this sort of thing. Lastly, camouflage and marking information is provided in two languages. This looks like a nice little kit, one I'm looking forward to building. It will be a nice departure from the usual suspects ..... It's not one I'd recommend to someone who has not built a resin "garage" kit before, but if you like the oddball, and have some experience and more patience, it's a good deal. Review kit courtesy of my poor, over-taxed wallet.